High strength bonding of metals, plastics and composites from an acrylic adhesive that doesn’t need primers to perform. 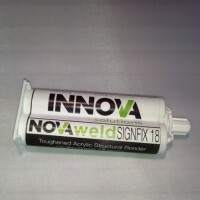 There’s strength and versatility in NovaWeld SignFix 18. 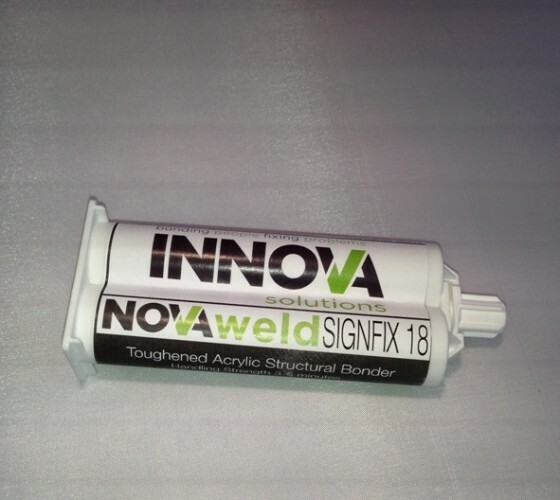 The two-component structural adhesive is designed for bonding metals, plastics and composites. And because most surfaces can be bonded without primers (and can be handled in around 5 minutes) your production processes are improved. Consult the SignFix 18 material safety data sheet (MSDS) before using for the first time. Carry out surface preparation where required. Contact us for help and advice. Remove cap and attach mixer nozzle. Allow the adhesive sufficient time to achieve handling strength before moving or unclamping.